In this article, we examine two questions: What role is given by the Anglican Communion to the Seven Ecumenical Councils and what authority does the Anglican Communion give the Seventh Ecumenical Council in particular? The “undivided Catholic Church” is the Church of the first one thousand years. During this time before the division of the Church, seven Ecumenical Councils were held and accepted by the whole Church, East and West, including the Church of England. 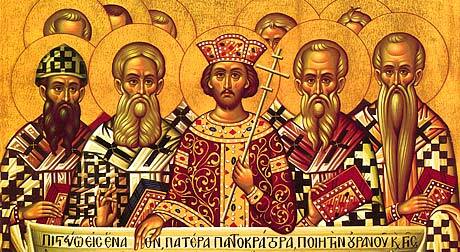 “Seven councils are recognized as ecumenical by both eastern and western Churches: Nicea (325), which dealt centrally with the divinity of the Logos; Constantinople (381), which established the formula for expressing the Trinity and dealt with the divinity of the Holy Spirit; Ephesus (431), which decided against Nestorianism and promulgated a definition of the person of Christ.” (In another place, the Dictionary names the fourth Council, convened at Chalcedon in 451 as defining the union of the divine and human natures of Christ as ‘the touchstone of orthodox Christology.’) Speaking of the last three Councils, the Dictionary continues: “Constantinople 11 (553); Constantinople III (680-681); and Nicea II (787). These last three councils refined previous work on the person of Christ and defined the role of images in worship. “According to our English statute, I Eliz. c. 1, s. 17 (s. 36 in one edition) (o), heresy is to be determined ‘by the authority of the canonical Scriptures, or by the first four general councils, or any of them, or by any other general council wherein the same was declared heresie by the express and plain words of the said Canonical Scriptures...’"
The Second Book of Homilies of the Church of England specifically enjoined on the Church by Article XXXV of the Articles of Religion, also specifically recognizes the first six Councils. The only General Council about which there is any question is the seventh. What is its status? What about the role of images in worship? In 1977, the Anglican Communion, in dialog with the Eastern Orthodox Church, in the Moscow Agreement, agreed with the Orthodox use of icons, as promulgated by the Seventh Ecumenical Council. Thus, the work of the Seventh Council in “refining work on the person of Christ and (defining) the role of images in worship” is clearly approved by the Anglican Church. Unfortunately, some persons, claiming to be Anglican, think that any use of images, whether they be icons, pictures, statues or even stained glass windows, is somehow worship of these images as idols, and a violation of the Ten Commandments, and of the Articles of Religion, especially Article XXII. Clearly, idolatry is condemned by God in the Second Commandment. Worship is only to be given to God. We must not worship anything else; not a person, not a thing, not any image. However, the Seventh Ecumenical Council is very clear that while we may honor heroes of the Church (saints), and show respect to the cross and other images, we must not, under any circumstance, confuse honor and worship. The problem is that in English (and Latin), the word “worship” can include “honor”, thus confusing the two. In Greek however, (the language of the Seventh Council) a clear distinction is made. The worship intended for God only is called latria and latria can only rightly be given to God. It would be idolatry to give latria to any other person or thing. “Respect”, or “honor”, on the other hand, can be given to a person, or a symbol. As Americans, we give honor and respect to the “Father of our Country”, George Washington. We show honor and respect to the American flag. Likewise, as Christians, we show honor and respect to the saints and to the cross on the altar. This is called dulia in Greek. With this clear distinction, Anglicans conform to the spirit of Nicea II, and also abide by Article XXII. Further, one is specifically referred to E. J. Bicknell’s The Thirty Nine Articles of the Church of England. Bicknell reviews the Greek distinction between dulia and latria, and points out that Article XXII does not condemn all use of images, but only the “Romish” practice. It is not at all clear, he points out, what that “Romish doctrine” refers to, but it is not a condemnation of the Greek practice proclaimed by Nicea 11, and affirmed by the Moscow Agreement. Clearly then, we can say that the Anglican Churches, with the whole Catholic Church, East and West, accept the Seven Ecumenical Councils, and specifically recognize the Christological and iconical teaching of the Seventh Council. Bishop William Wantland is the retired Bishop of Eau Claire. He assists in the Diocese of Fort Worth.